The J.S. Paluch Company began in 1913 as Merchants Press on Ashland Avenue on Chicago’s north side. Founder John S. Paluch initially printed church forms, baptismal and marriage certificates, parish newsletters, and assorted fund-raising materials for local Catholic parishes. As the business progressed, he soon added devotional items and increased the company’s religious selections. His repertoire continued expanding, but John didn't know just how far his little company would grow! During the 1960s following Vatican Council II's significant changes, Chester Paluch introduced the weekly Missalette®, guided by numerous clergy, religious, and lay liturgists in the Archdiocese of Chicago. Missalette® in hand, parishioners began actively sharing meaningful prayer dialogue, in English, with the celebrant and each other. As the role of music grew in the worshiping community, Chester sought ways to add music to JSP’s publications. In 1971 he purchased World Library of Sacred Music in Cincinnati. Today, this company is World Library Publications, the music and liturgy division of J.S. Paluch Company, Inc. WLP offers comprehensive liturgy and music resources and pastoral support services for priests, liturgists, music directors and parish musicians, RCIA catechists and catechumens, youth and young adult ministers, and other parish ministers. Today Seasonal Missalette®, We Celebrate®, ¡Celebremos!/Let Us Celebrate!®, and Word & Song have become important components in parish liturgical celebrations all over the country. Rejoice Music Edition and Missal, Misal Parroquial, and the hardbound hymnal One In Faith are the latest additions to J.S. Paluch’s offerings through WLP in this area. Church musicians find inspiration in WLP’s vast collection of music resources, including printed and recorded music for choirs, cantors, and instrumentalists. The Voices As One songbooks, music resources, and recordings provide support and materials for contemporary musicians as well. WLP’s offerings have expanded to include materials for scripture study, personal growth, and support for ministries of the Church. These include Liturgy of the Word and Living the Word, and books in the Fountain of Life series for RCIA, the Pray Today series for various Church ministries, and the Worship Works series. The J.S. Paluch Company provides an extensive variety of bulletins in numerous formats and sizes. We have expanded from a local supplier of Sunday bulletins in the Chicago area to a nationwide publisher. Offices in Illinois, California, Florida, Louisiana, New Jersey, Pennsylvania, Texas, Missouri, and Puerto Rico supply custom - printed weekly bulletins to thousands of parishes around the country. Ads for the bulletins are sold by a national sales force of nearly two hundred people. The Paluch Company continues to be the leader and innovator in today’s industry. In 1992 we introduced Laser - Com Express, a state - of - the - art bulletin service; ours was the first company to provide typeset bulletins, telecommunicated copy, and laser printing to their customers. 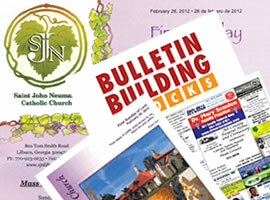 Bulletin users also receive an extensive collection of artwork, graphics, and headings for their bulletin layout. The J.S. Paluch Company is committed to vocation awareness. In 1983 the company published its first Catholic Family Appointment Calendar with a vocation theme for distribution at the parish level. Our calendar division has grown into one of the largest providers of Catholic calendars in the country. 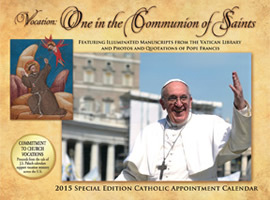 The sale of all our Catholic calendars helps support vocations. In 1985 the company established the National Vocations Awareness Division (NVAD). Since 1988 we have hosted and underwritten an annual national vocations seminar that provides an ongoing forum for continued collaboration among leaders in vocation ministry and related church organizations from across the U.S. and Canada. Mary Lou Paluch Rafferty serves on the Mundelein Seminary Advisory Board and on the Board of Directors of the Sanctuary of Culture Foundation. William Rafferty is Treasurer of the Board of Directors of the Sanctuary of Culture Foundation. The company supports many local and national vocation-related projects and programs through sponsorships and in conjunction with the Paluch Family Foundation. The Paluch Family Foundation recognizes and supports Catholic ministries in the areas of vocations, stewardship, and liturgy. Business generated through these ads is done locally, and that is bene?cial for everyone. As long as Jimmy Magic’s is cleaning, they will be advertising with J.S. Paluch! My happy customers often tell their friends at church about my services and shortly after I am getting calls from new parishioners telling me that I was referred to them by so and so at church. I chose to advertise my law office in my church’s bulletin after a fellow attorney said that advertising in his church bulletin is his absolute best source for new clients.